Mom and I have this new activity. She is my new swimming companion. 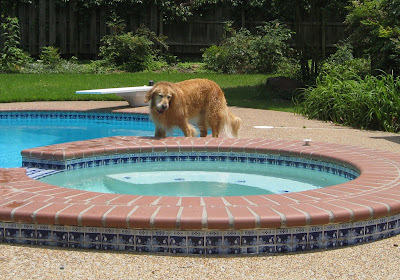 I used to love fetch swimming with my brother Oliver in the pool. Then when I went to the beach, I would always pick one dog and fetch swim with him or her out in the ocean. I have always liked to fetch swim with someone, so why not my Mom? No, she doesn't go after a ball she just does laps. But I get to swim beside her back and forth just like my canine partners and she likes it. This is just more evidence. I really do think she must have some canine in her DNA. P.S. Mom is not in the picture because she is beside me taking it. So the results of Fuzz's DNA test came in. And no one guessed right! (Not even my Mom and she is always right.) 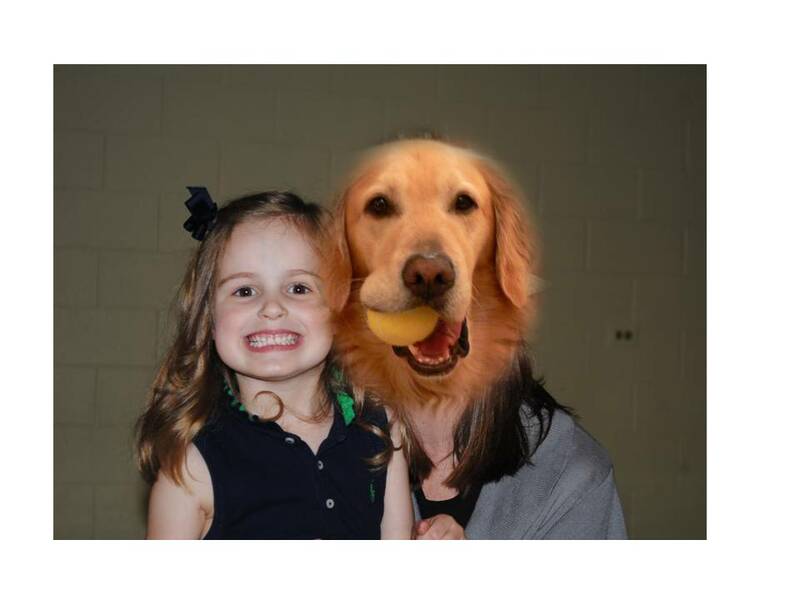 Well, Fuzz is part Golden Retriever which we figured. But he is also part Collie! How cool is that. He's a Golden Collie! That means he might be related to Lassie! 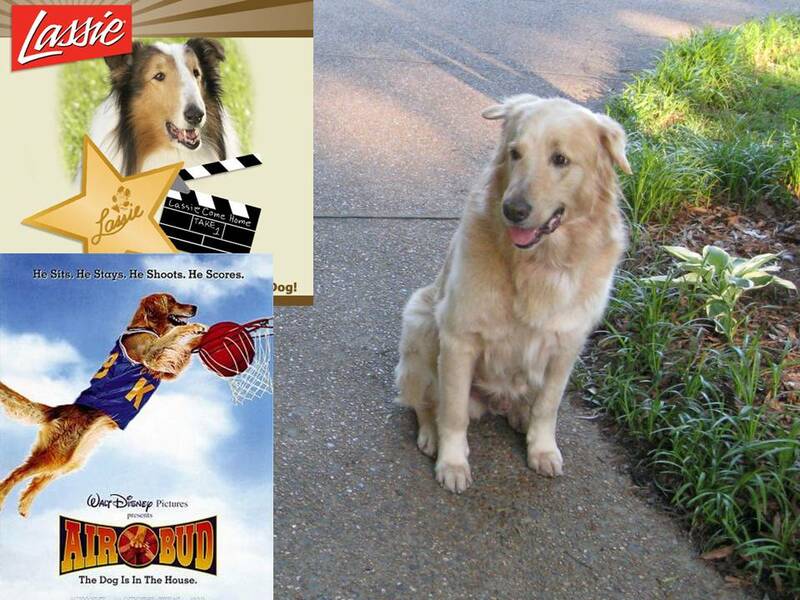 So, since I am now his brother, I am related to Lassie. What a great combo. AirBud and Lassie! There is a confusing situation. Fuzz calls me his big brother and I call Fuzz my big brother. Fuzz says that I am older, so I am the big brother. But I tell him that he is my big brother because he is bigger (taller and heavier, although he points out that he is not fat at all.) So we have agreed to both be big brothers, but it is very confusing to others. I think we need an outside opinion. Who do you think is the "big brother"? Today is Dad's birthday. It got me to thinking about what Dad must have been like when he was born. So Mom showed me a picture of baby Dad. I can't believe how little he once was. He was smaller than me! It is really hard for me to imagine! But I know it is my dad because I think I see the resemblance around the eyes. Don't you? Last weekend I heard a new concept called time out. My nephew Lawson was being a little wild and wasn't listening to his Mom. His Mom kept warning him that if he didn't behave he would go to time out. Well he still didn't listen, so she said OK, we are going to time out. So she took him upstairs. I didn't really understand. If she said they were going to time out, why did she stay in? Why didn't she go outside for time out? That is really bizarre. 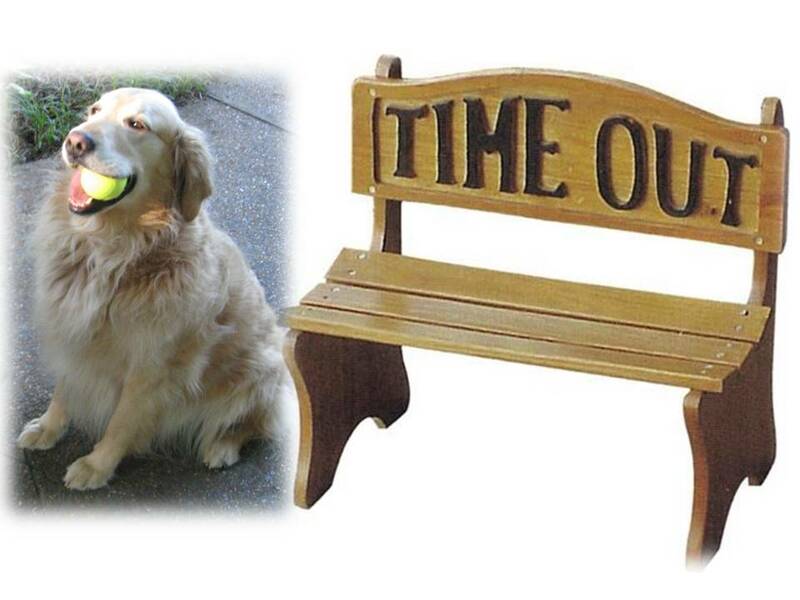 Well, I have never been sent to time out because I am a good boy. So I guess I will never know. My family likes to be outside during the weekend days. But I am too hot. Bear goes in the pool. I don't like water. I like to stay inside in the A/C. But Mom and Dad really want me to be outside with them. So they took me to the pet store and bought me some stuff. Bear said it was bribes. First they bought me some toys that squeak and I could play with outside. They were fun. But certainly not worth being hot. Then I saw the giant bully stick. Now that got me interested. Yes. I chewed on it for a few minutes, but then I got too hot and wanted to go inside. So they let me in without my bully stick. Do you think Bear ate my bully stick? Tonight is the L.A. premiere of The Twilight Saga:Eclipse. Now you might wonder why I know that. Well, tonight my sister Sydne will be on the red carpet doing commentary for E!Online. How exciting is that! I am so proud that she is my sister. So it got me to daydreaming. 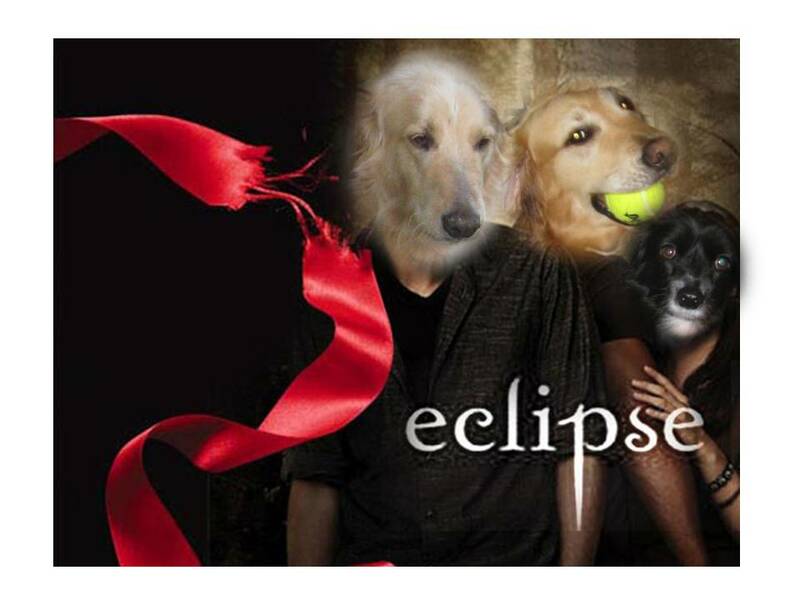 What if I were the star of the Twilight movies. And of course, my costars would be Fuzz and BunnyBell. I'm glad it is only a dream because I am scared of vampires and werewolves. So it wouldn't work out. But I can't wait to watch Sydne talk about it! 5:00 Pacific time from Hollywood! 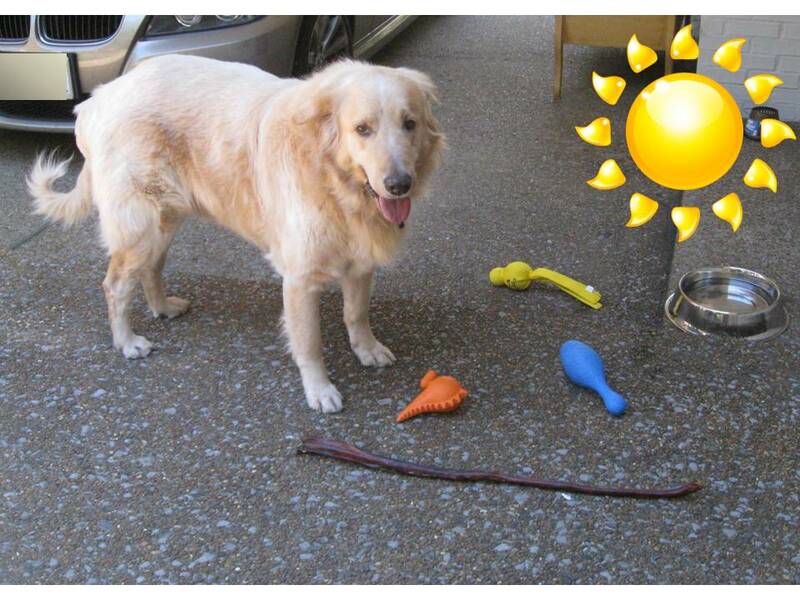 Last week when my human brother was here, we played this game while we were out by the pool with Dad. They took my ball and threw it back and forth to eachother. I was in the middle, trying to catch it on each throw. I didn't understand why they weren't just throwing it to me. Dad told me we were playing Monkey in the middle. I asked him where the monkey was. He told me I was the monkey in the middle. I didnt get it. I am a Bear, not a monkey. So I guess we were playing Bear in the middle. Well, I really prefer fetch. It gets to be like 100 degrees outside. So during the day, if I am not swimming in the pool, all I'm thinking about is being in the house in the cool A/C. And then there is my Dad. On weekends, when he finishes working out and he is dripping (I'm glad I don't sweat) he goes and turns on the hot tub. He waits until it gets real hot and then proceeds to sit in it. Now mind you, it is daytime, so he is also baking in the sun. He asks Fuzz and I to be outside with him and throws the ball for me to chase. We tell him to get real and we run inside. I just don't understand the point of a hot tub in Memphis in the summertime. I got to meet my nephew Lawson last weekend. He is very cute. He even likes to play ball with me. Well, it was more like he tried to play with me. 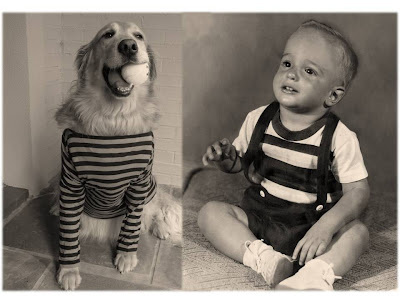 He kept on throwing a ball to me when I already had one in my mouth. And then when someone took my ball from my mouth and gave it to him he just handed it back to me. That was nice, but someone needs to teach him to play fetch properly. 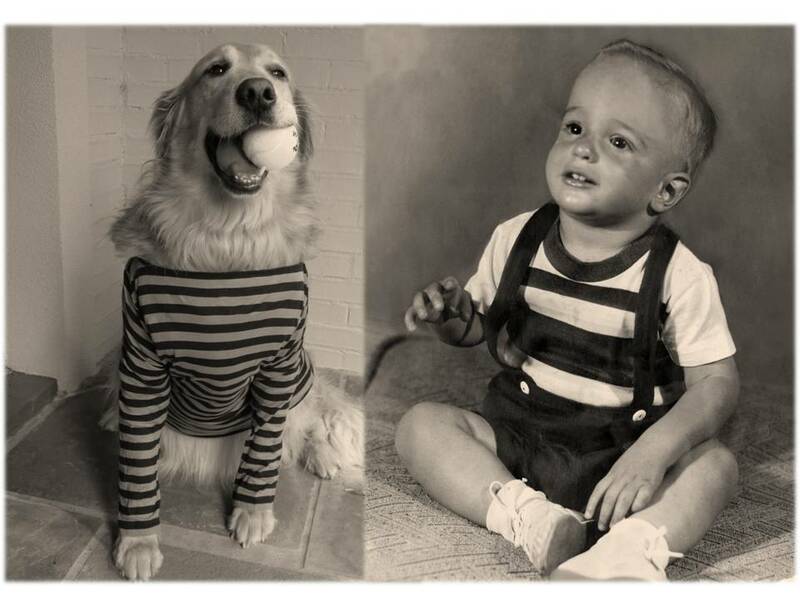 Come to think of it, it would be good for human children to learn from a very early age how to play fetch with dogs. Maybe Sesame Street can have a segment on it. Today is Father's Day. I love my Dad very much. I know he loves me too. He used to love Oliver more and now I think Fuzz may be his favorite. But I think that is only because Mom is my favorite and Dad is my second favorite. So I guess it is only fair that I have always been his second favorite too. I would love to eventually become his first favorite, but I also like to have goals which I know I can possibly achieve. So #2 is not so bad. Happy Father's Day to my #1 Dad. 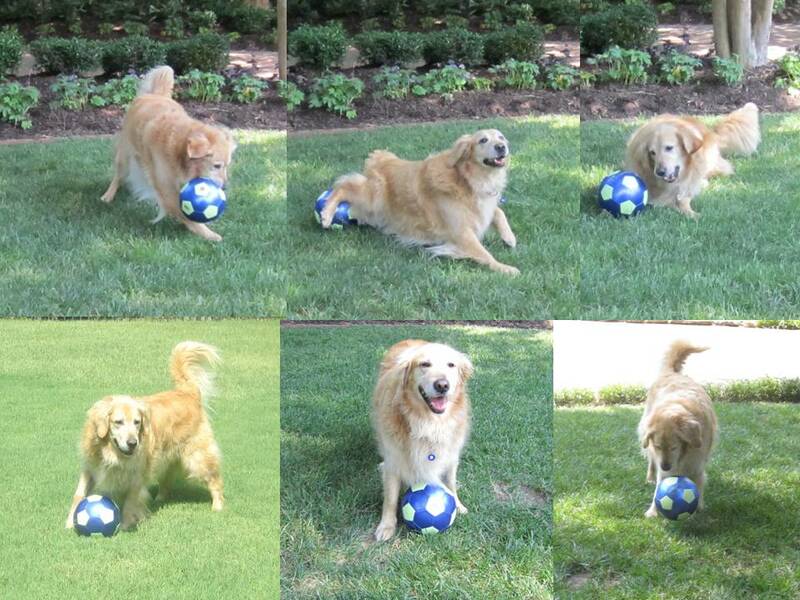 With all the excitement around the World Cup, I decided to see what soccer was all about. So my mom took out a soccer ball (it is really amazing that she has all these things). First she threw it on the grass and said to chase it. No, that is not what I saw them do on TV. So then she went over and kicked it to me (so much for her sore ankle). That is when I went after it and tried some paw kicks. Now that was lots of fun! 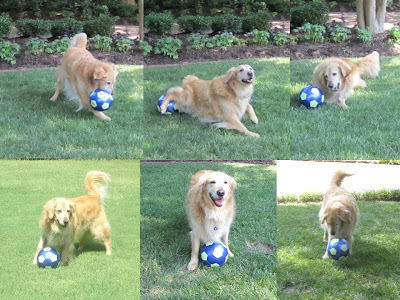 No wonder AirBud took up soccer. 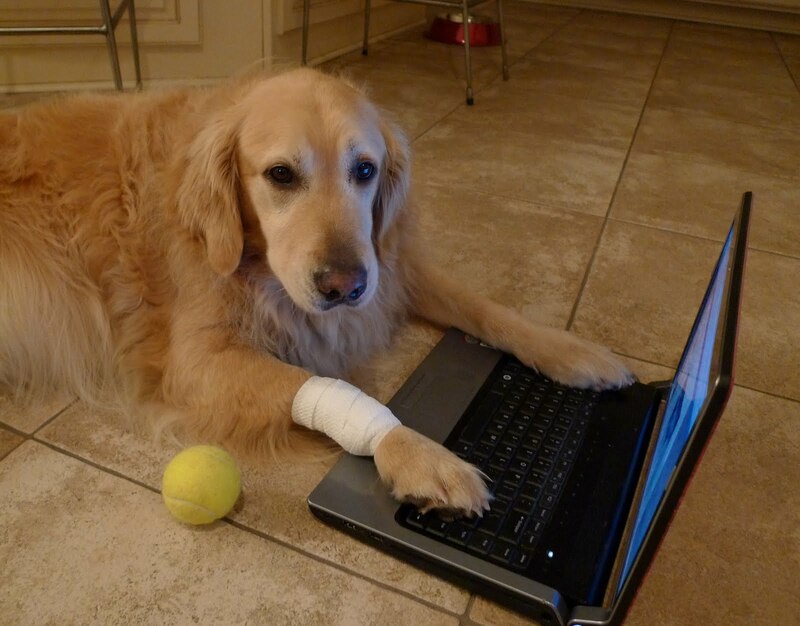 I should start practicing for the next Woof Cup. Today I want to recognize the opening Toy Story 3. 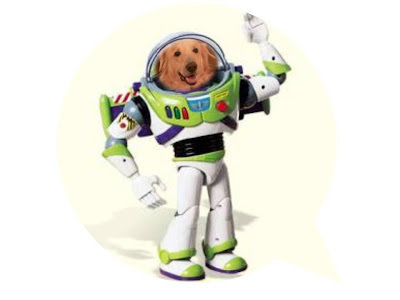 Buzz Lightyear is my idol, that is why one of my favorite nicknames is FuzzLightyear. In fact I prefer to be called Fuzz. I am disappointed that I can't go to see the movie. Bear told me we are not allowed. So I asked Mom if we could watch Toy Story 1 and 2 at home this weekend. She said we could watch one of them. Bear is already on my Mom's case to have popcorn for our movie. He told me she always shares since she doesn't want to eat the whole bowl herself. So... To infinity...and beyond! 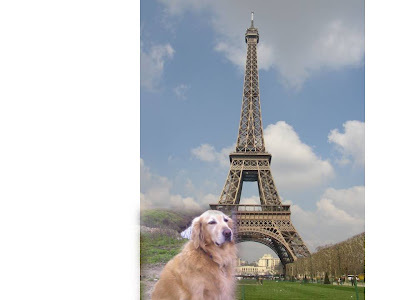 My Mom and Dad just got back from Paris. I was just so disappointed that I was not able to go. I was even trying to learn French. Bone jour, Au Woofoir, J'e yourpal Bear, and of course I love you... Je t' aime. Mom explained that it was their anniversary trip so I needed to stay home. Well, I understood that I guess. But I really would like to go to Paris one day. I have a feeling though that I will need to settle for Paris, Tennessee. 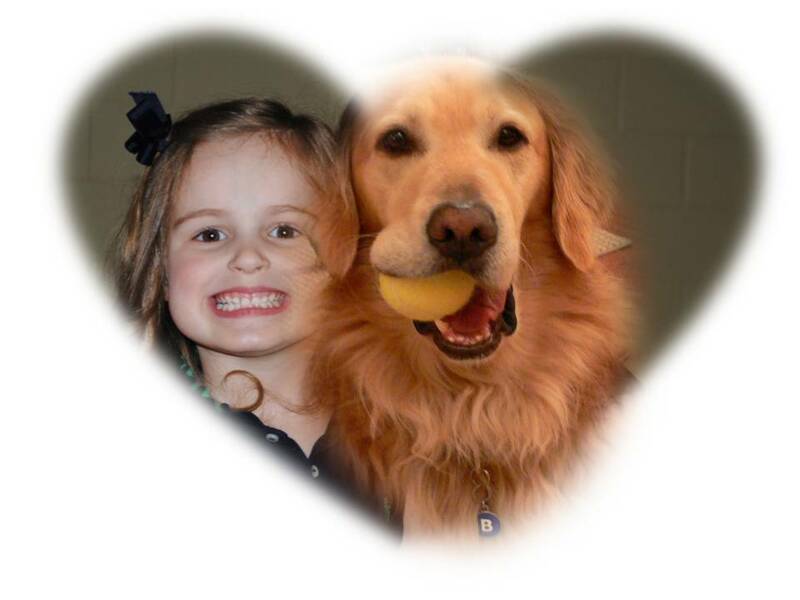 Today is my niece Caroline's birthday. I can't believe she is turning four! That is how old I was when I met her. She was just a baby! Last year she visited us in San Diego and came to the beach with me. She loved the beach, but didn't care too much about me. Next month she is visiting us in Memphis. I hope she will come in the pool with me. Her mom told us that she loves dogs now. So I hope she loves me now. I love her very much and can't wait to give her a great big Bear hug! As you may or may not know, everyone in my family has some recent bone ailment. Dad with his injured heel, Mom with her broken toe and fractured ankle and Fuzz with his broken toe. Don't be concerned, they are all healing nicely. I was the only one without a bone ailment. But the other day I heard about this thing called carpel tunnel that could happen to your wrist if you use your computer too much. So I have decided to take a break from blogging for a little while. I want to protect my wrist and make sure I don't get carpel tunnel. In the meantime, if you miss your daily Bear fix, you can read back posts. I am sure most of you haven't seen all of my posts. I have been posting daily since January 25th ! Fuzz has been with us over a month and he never wanted to go upstairs. So Mom hasn't been using her upstairs office (she works in the kitchen) and Mom & Dad don't use the upstairs family room with the big TV. So Mom decided to try to get Fuzz upstairs last weekend. Well it was pretty easy, she just gave him treats all the way up and he came right up. Everyone was happy. Then it was time to go down. Uh Oh. Fuzz wanted nothing to do with it. He was very scared. Mom put treats on every step and kept giving them to him each time he went one or two steps, but he just ran back up. Then she took out the big guns- freshly grilled chicken pieces. That got him down 5 steps, but again he ran back up. Finally, my dad got out his collar and leash and got him to go down the stairs at which point he got lots of praise and more chicken. So that got me to thinking. If I refuse to go down the stairs will they get me pizza? It is that season again when Mom glues herself to the TV on Monday night. Nope. Not football. The Bachelorette. I still don't know why they don't have this show for dogs. I do not want to be the bachelor anymore, now I want to be the host. For the first Doglerette I think it should be BunnyBell. She is my neice, so I need to give her first dibs. 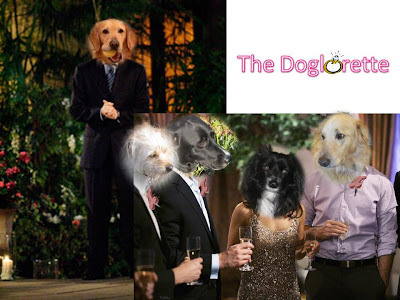 I as host will introduce her to the dogelors and she will give out bones. Uh oh. I dont know if it is going to work. I just can't imagine BunnyBell giving up bones. 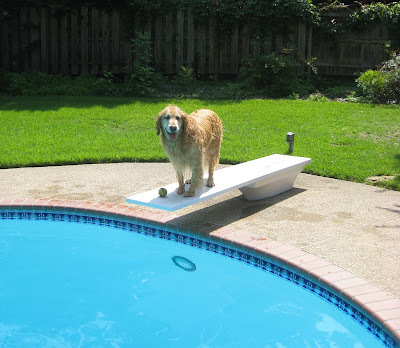 At home we have a diving board that no one uses. So I got on it today thinking if it is something I might want to do. I watched competitive diving in the Olympics and it was very exciting. It looks a little scary when they are up so high, but I would start out low on my diving board. So should I do a forward, back, reverse or inward dive? Should I start with a pawstand? What about incorporating a twist? Don't I sound like a diver already?! Actually, after reading more about it, it is too complicated. I will just continue to walk in the pool by stairs. So much for Bear Louganis. 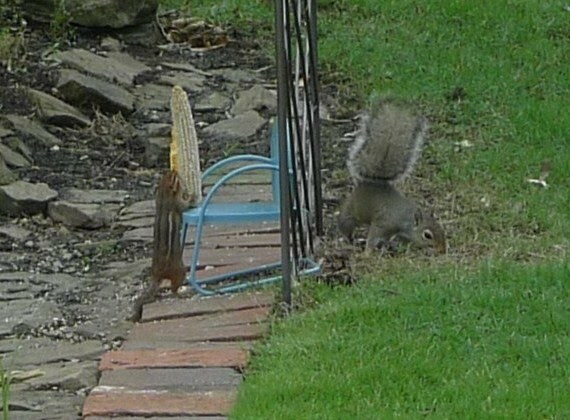 This is an update to my post about the squirrel chair. The chair has caused daily drama in my yard. 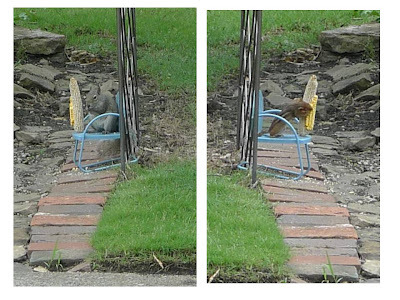 Rocky the squirrel was perfectly happy nibbling at the corn on the chair. Dad would replace the corn every few days or so. Then we started having to replace the corn at least daily. Well, this week we discovered why. Alvin the chipmunk appeared. Don't know how such a little guy can eat so much! Well, Rocky is not real happy with Alvin around. 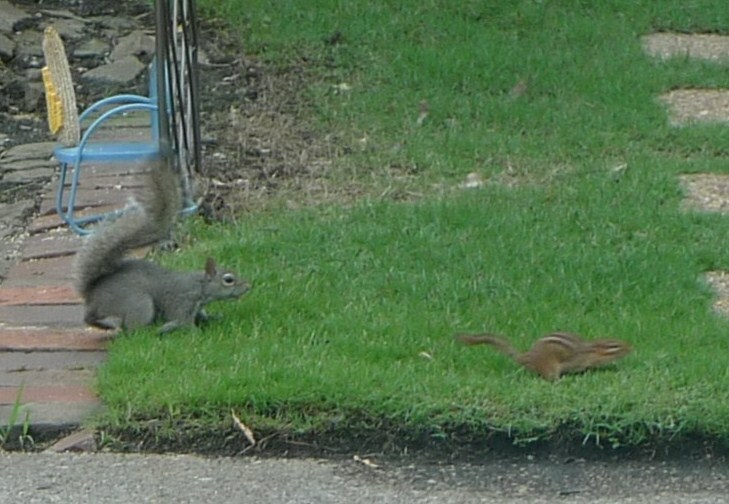 Alvin and the chipmunks go to get the corn when Rocky & friends aren't around. But Alvin even goes when Rocky is there. So Rocky has started sitting in the chair to protect his corn. But that doesn't stop Alvin. 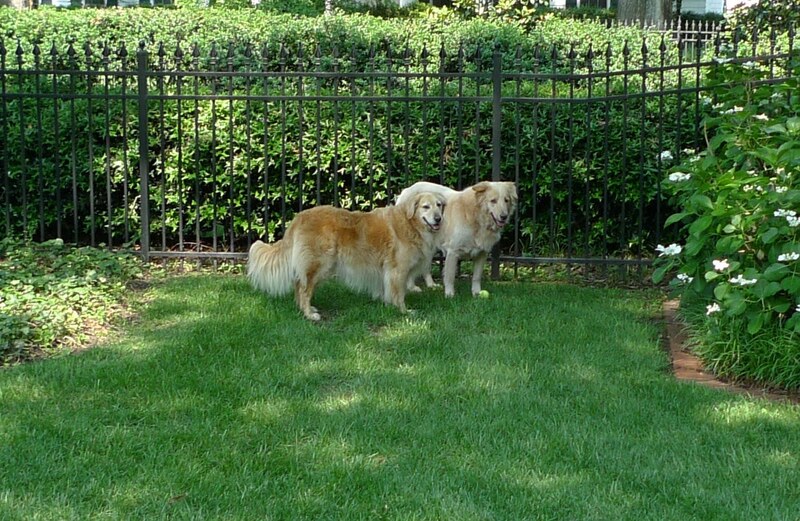 He just waits till Rocky gets off and is not looking. Sometimes Rocky sees him and yells at him and Alvin scoots. 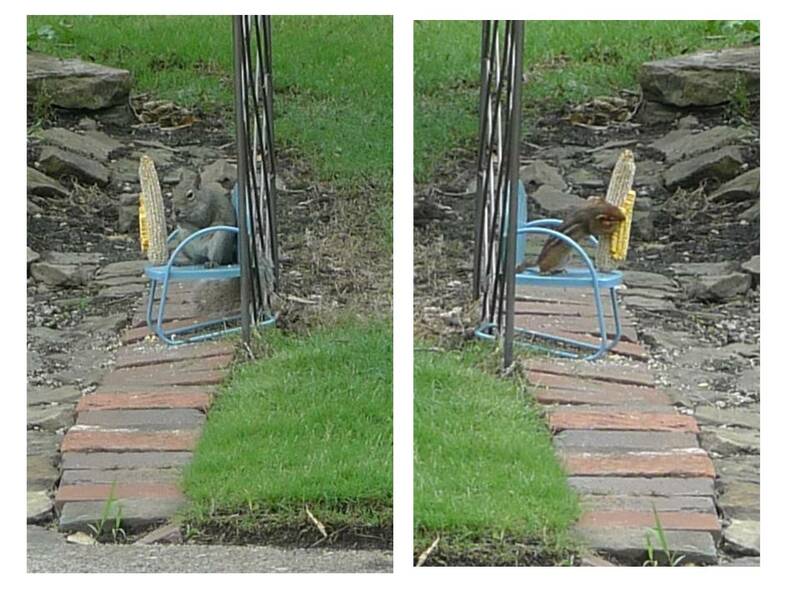 Other times, Alvin just goes on the chair himself and climbs on the corn! I'm not sure who to root for. What do you think? Alvin or Rocky? I have a nickname here in my new home. 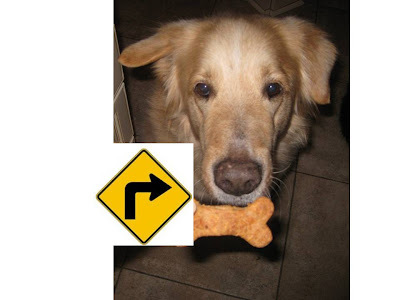 "Right Turn". I am not sure I totally understand. Mom and Dad say that my right ear looks like a signal to turn right. That made Bear think it is like a car signaling a turn. So now Bear wants to put a blinking light on my ear so that my nickname is more understandable. I dont think I will let him do that but I am willing to listen to his bribe. But it needs to be more than just one biscuit. In February when I was an only dog, I did a blog post on my ten collars. I thought I would do an update now that Fuzzy's here too. I have more collars (12) than Fuzzy does at this point (7). My new favorite is bright green with squirrels and trees on it. Perfect tribute to my new home! Mom tried to get Fuzz some coordinating ones to mine. So he has a green/blue preppy stripe and a horseshoe one matching my crabs. Then Dad picked out a bright blue one with hearts and bones. Made sense since he loves bones. Mom picked out the Dog of war one since he likes to play tug of war. She also got us cool matching ones which have historical American flags on them. This count does not even include the upcoming holiday collars. Are you sure this is normal? Fuzz doesnt like tennis balls or swimming. However, we do have one major activity in common. 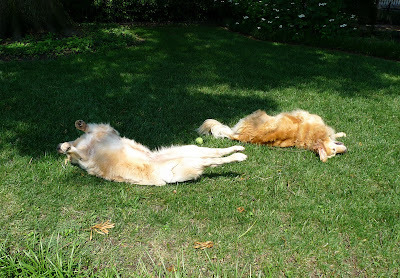 Grass Rolling. Fuzz has become my rolling partner. Where as I like to rub my spine hard and go back and forth a lot. Fuzz is more of a stretch roller. He likes to take his time and stretch his paws really far out before rolling to the other side. He also makes noises when he rolls. Maybe he is doing some kind of ancient dance that I dont know about. I need to watch more carefully. Nah. 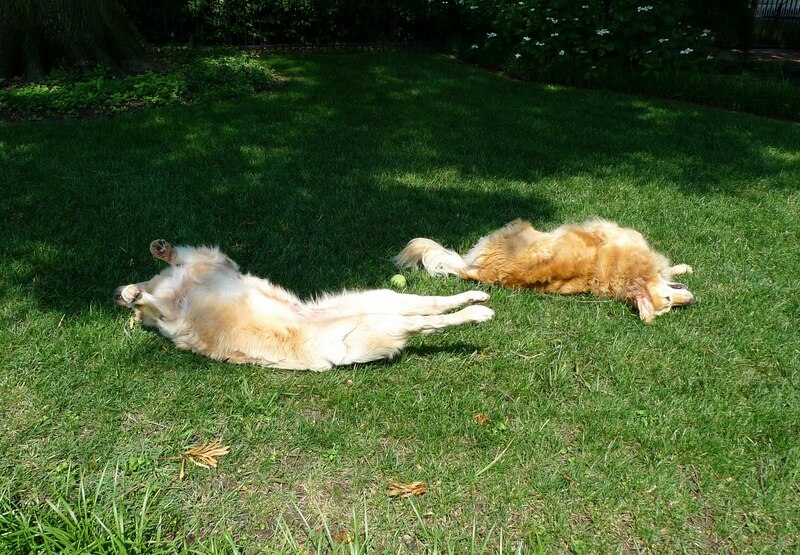 I will just spend my grass time rolling, not watching. 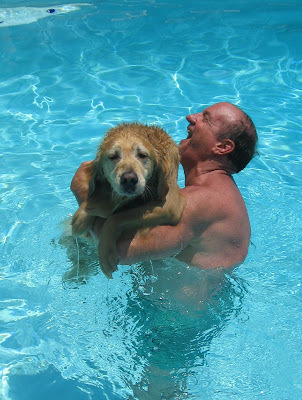 My dad loves to take his little grandkids in the pool and carry them around. It seems like so much fun. So yesterday when Dad was in the pool, I decided I wanted to try it to. So I swam over to Dad and he lifted me up like a baby. It was a little weird at first, but really nice to be held by Dad. Maybe next I'll try jumping in his lap and he can bounce me on his knee. Not.